Mango Jeans first appeared on Chictopia's streetstyle gallery in Fall 2008 seen on Makati blogger joannaladrido of joannaladrido.com. She styled her black Mango skinny jeans 12" jeans with a white 3/1 phillip lim white brocade embroidered blouse with black chiffon details shirt, black Fendi floral embroidered patent leather limited ed. b-bag bag, and red Nine West suded peep-toe shoes. Since then, Mango Jeans have grown in popularity as bloggers from Jakarta, Washington, and Madrid have discovered them. Mango Jeans are generally seen in casual, chic, and comfortable style. Popular types of Mango Jeans are diy ripped, boyfriend jeans, jeans, skinny jeans, and skinny. Blogger's favorite colors are blue, black, navy, and white. 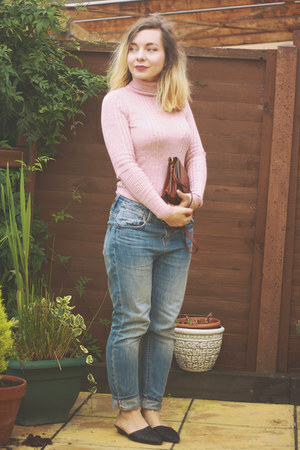 There are currently 1647 streetstyle photos of bloggers wearing Mango Jeans. Most recently, blogger Fashionella of cooknfashion.blogspot.co.il wore her heather gray Mango jeans with a gray H&M cardigan.